Jenni Liddiard of Field Farm in St Lawrence is well known for the lean and tender lamb that she raises on lush pasture, and the fresh free range eggs that are available from her farm gate. Recently, Jenni (formerly known as Jenni Riggall) has begun creating apple juice, a long held ambition since she first started her farm. Jenni explains that "As apple juice is one of my favourite drinks I decided to plant an orchard when I built the farm 5 years ago. I went into quite a bit of detail with the nursery to ensure that I planted the right trees for juice making." The orchard at Field Farm is planted with dessert and culinary apples, not cider varieties. After a trip to Switzerland a couple of years ago, Jenni discovered 100% pure juice sparkling and then, to her delight, discovered a company in Ireland who made a cloudy version, "They very kindly showed us how to make it, it is a little time consuming but very much worth it." The final drink contains only pure apple juice, vitamin C to prevent the apples discolouring, and some bubbles. "The procedure involves milling the apples then pressing and straining, to achieve a cloudy but not sludgy juice," explains Jenni. "It is then blended and pumped into a gravity filler which fills the bottles. The juice is then chilled overnight before being carbonated and capped with a special machine. It is then pasteurised to stabilize and stop fermentation before being labelled." 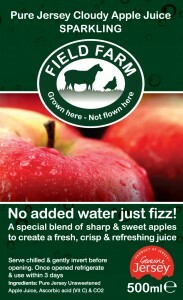 The Field Farm commitment to producing "top quality local products from animals that have an enhanced quality of life" is evident in the process of creating the apple juice. The pigs on the farm feast on the left over apple pulp from the juicing process, then the composted manure is used to nourish the trees in the apple orchard. 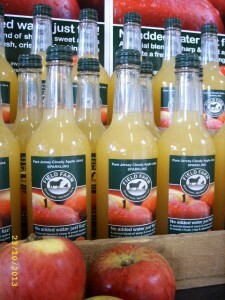 Pure Jersey Sparkling Cloudy Apple Juice was launched at the recent Black Butter event at The Elms and was a great success, Jenni says "every-one thought it was delicious." The juice is available from Classic Herd Farm Shop in St Peter, Woodside Farm Shop in Trinity, Coopers Castle Quay in St Helier and at Cafe Delicia at Catherine Best, St Peter. To stay up to date with Jenni and Field Farm, "Like" her Facebook Page here.